Now Available Nationwide. Visit Your Local Bookstore Today! Order the special first edition now from The Cavaliers! Order it for you or a as a gift for a wedding anniversary, for a birthday or just to make someone smile. Whether he/she is a bookwarm or not, Building the Green Machine will make him/her love poring over the pages of this cool book. But there's basically no chance that you're not keeping the book for yourself after you have read it. Also with a preface by Cavaliers founder Don Warren. Can the Van Halen. Rack your Kid Rock. Stow your Styx. For this musical journey, we're leaving the amplifiers with the long-haired pretty boys in spandex and taking a flying leap from the concert stage: to a football field, baking in the heat of a late June afternoon. Sixty guys spread out in a loose parabola near the 50-yard line, lean back with horns in their hands and manufacture loud the old-fashioned way -- with their lungs. With those words, author Colt Foutz opens Building the Green Machine, which tells how a ragtag bunch of Boy Scouts from Chicago's Logan Square grew into the one of the most popular marching groups in the world, winners of 20 national and world championships. 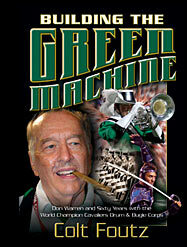 The story of the Cavaliers Drum & Bugle Corps is also the biography of their charismatic leader, Don Warren. With no musical talent, Don founded the Cavaliers as a teenager and has led them ever since. His gift for working with people -- instructors, parents, volunteers, the kids -- built the Cavaliers into a musical juggernaut, "The Green Machine". Hop along on the tour bus for this rags-to-riches ride. From more than 200 interviews with Cavaliers alumni, and officials, musicians and fans throughout drum corps, Foutz gives a behind-the-scenes look at the camaraderie, guts, politics, pranks and tradition that have shaped marching music over the last seven decades. Whether you're a drum corps nut, or a newcomer, you'll laugh, cry and cheer for Building the Green Machine. Copyright 2007 by Colt Foutz. All rights reserved.